Tuch and I awoke to the sound of a stiff breeze ruffling our tarp and tent, and whispering through the trees. When I stepped out of the tent I was concerned; the wind was coming almost directly from the east. The vast majority of our paddling would be straight into the wind. The sky was overcast, but didn’t look threatening. I hoped it wouldn’t rain as we made our way to Onnie. As I started packing up camp Tuch began making breakfast. With food in our bellies and the canoe packed, we pushed off towards the creek leading to Lac Lammont. With the wind at our back we quickly rounded the point on Lac Lammont across from where we had caught the two walleyes the day before. As we approached the portage leading into Telescope, the sound of falling water could be heard. Two motor boats were cached along the eastern shore a short distance from where Lammont emptied into the creek. We landed our canoe next to the boats, I was perturbed by the fact that the boats made easy passage at this end of the portage impossible. Once we had the boats behind us it became clear that the start of the portage actually started closer to the falls, away from the boats. Perhaps I shouldn’t have cursed the outpost operator. The portage was dry and mostly downhill, we were loading up our canoe to enter Telescope sooner than I thought we would. As we pushed our canoe into the lower section of the stream flowing into Telescope multiple channels presented themselves. We chose the right one for the first bit, but then chose incorrectly, and had to double back. We eventually pulled into a bay of Telescope; the outpost was located on the eastern shore of the bay, on a point overlooking the main body of the lake. The wind funneled into the bay, and was slowing our forward momentum. The outpost had a fireplace or wood stove burning, and the scent of burning wood carried to us. It appeared that all the boats were at the outpost; the weather must have intimidated the occupants. I wondered to myself what the occupants thought when they saw us round the point and enter the main section of the lake. Our canoe likely looked vulnerable in the waves. Telescope Lake is perfectly named, the lake runs west to east with progressively larger sections towards the east; looking at the lake on a map does reveal its telescope shape. The largest section is the last we have to cross. We had approximately 4km left to paddle to reach the portage, and would be provided with only one point to rest behind before crossing through the last narrows and entering the final section of Telescope. With muscles tiring we struggled through the last section. When we reach the leeward end we could see an eagle circle overhead; it landed on a tree close to shore. We tried to take a few pictures, but the eagle was a little too far for our camera. We continued into the bay where our next portage would be found. Just north of the creek entering Telescope there appears to be a landing, and I make the mistake of assuming this is the portage. From where it enters the lake the trail splits into two directions along the shore - towards and away from the creek; we tried both but they seem to lead nowhere. After six days of being able to find the portages easily I was a little confused, and I wondered why this portage is so difficult to find. We decided to paddle along the shore and sure enough approx 100m from where we were is a clear path leading in the direction of our next lake. I should have looked at the map closer; the portage is shown a significant distance from the creek on the map. There were a few older moose or caribou tracks in the mud along the portage. The trail did not either annoy or impress me; it was just another portage by this time. But the end of the portage leads you into something beautiful, the chain of Hjalmar lakes. Each of the three lakes are long and narrow surrounded by mature forest rising the length of the south and north side. I am glad we decided to come this way; it seems to be a special place. The only problem with these narrow lakes is that they allowed the wind to funnel through them, and although all three are not very large the wind made our passage tougher than we expected. We quickly reached the end of the first Hjalmar lake, and we decided to try to paddle upstream in the creek. Due to the high water we were doing well until we were just downstream of a beaver dam. The current was a little too strong here, and we wouldn’t have been able to make it over the dam anyway so we both got out of the canoe and pulled it upstream over the dam. The middle Hjalmar lake is as impressive as the first with the elevation climbing sharply on the southern shore; it is mainly bare rock with occasional small trees growing. I imagine the view from the top is quite spectacular; the top would be the highest point of land for a fair distance in any direction. We stopped for a short break on the northern shore at an impressive day camp, but pushed on to the portage into the final Hjalmar lake. By the way we official left WCPP approximately half way along the middle lake. Near the end of the portage I saw claw marks in the mud; the space between the claw marks, and the size of the marks, made it quite clear they were from a bear. The good new was they didn’t look like they had just been made. Still, we made our second trip through the portage a little quicker than our first. The final of the three Hjalmar lakes is shorter than the middle lake, but is a little wider than the first two, and the waves seemed a little larger. Maybe it was just the fact we were getting tired of fighting the wind. When we started out our canoe's bow was pushed to the port side slightly; we were both too tired to try to pull the bow straight again so we covered the first third of the lake diagonally and rested along the northern shore. We started out again and the wind pushed our bow to the starboard slightly; once again I made the decision to just continue our forward motion at an angle, and we rested a second time along the south shore. Although we only had approximately one third of the lake’s distance to cover, the last portion opened up a little more. While we were resting my wife commented that she didn’t like the zig zagging we had just done. I didn’t either, but I was too tired to argue. We push out for the final time and gradually the waves subsided as we approached the leeward shore. I'd started to look for the last portage during our final push across the lake; by this point I though to myself that I could care less if it was in terrible shape - I just want to rest my paddling muscles. Knowing this was the last portage of today game me comfort. While wishing to be off the lake I thought I wouldn't care what the condition of this portage would be in. But as we approached it I hoped it wouldn’t be difficult. 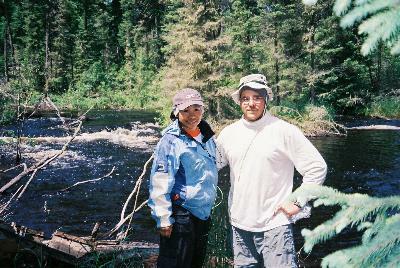 It turned out to be a good portage, and we saw plenty of caribou droppings nearing the end of it. Well, we finally reached Onnie Lake. The waves were larger on Onnie than in any of the Hjalmar Lakes, but we needed to reach one of the campsites near the eastern end of the lake. After crossing four lakes with a strong headwind in each, we were faced with our last challenge. We were hesitant, but after six days of tripping, our confidence and ability were stronger, and we decided to push on. We could make out the island we planned to camp on in the distance. There was one island closer that we used as a windbreak and rest point along our crossing. While approaching this first island the larger waves were passing within an inch of the gunnels of the canoe, and I was a little worried. If the wind picked up while we were crossing we could easily have become swamped. After a short rest we made the final push to our chosen site; the first bit was tough, but as we made it further away from the first island we also got closer to the second, and the waves began to settle. We were not struggling much now, and we were happy to arrive at the island. There was a small clearing to the southern tip, and we landed our canoe there. We unpacked all our gear and made a quick assessment of the small clearing; there was a small fire ring that looks like it hasn't been used for a year at least, and a decent area to cook. Upon further inspection it became clear that there was no location to set up a tent so we decided to walk around the island to see if there was a suitable site for our tent. To our surprise we found a clearing in the middle of the island with a picnic table constructed out of trees either from the island or the mainland less than a couple of 100metres away. There was a fire ring about ten feet away from the table, and another ten feet away we found our site for our tent. We returned to our gear and carried over our tent and everything we would need inside of it. As we began to set up the tent rain began to fall; after having a couple of days where we remained wet for long periods, I was in no mood to allow our tent to become wet inside. As quickly as possible we set up our tent, put the fly up, and covered most of the tent with our first tarp; we overlapped the first tarp slightly with the second. My wife began to set up the inside and I finished setting up the tarps. It was supper time so we headed back to the area we landed our canoe to cook our food; we decided to cook at the southern point as it was a fair distance from our tent, and was downwind. After a quick supper we decided to call it a day; its only about 7pm, but the rain was still falling. A small two inch pool of water had formed inside our tent at a low point above where our heads would be; I went outside to adjust the fly and we placed an already wet towel between us at the location of the pool. Shortly after the rain started to fall a little heavier; the leak had stopped, but I was concerned about the water running off the tarp to the front of our tent. The water was running parallel to the tent approx two feet from the edge; only a slight difference in elevation kept the water from running towards the tent. If the wind shifted, and blew towards the front of the tent, the water would likely have run towards the tent. I dug a small trench to keep this from happening. We decided to play cards to pass some time before we went to bed - a little game of war. While playing we heard a bird chirping cheerfully outside, it picked up our spirits slightly and I hoped it signaled better weather to come. We bored before the game ended so we put the cards away and tried to head to sleep around 9pm. The weather was still dreary; I awoke to the sounds of rain falling on the tarps above our tent, and wind rustling the leaves of trees around us; I don’t think it stopped raining all night; each time I woke up through the night I heard the rain hitting the tarps. The birds we heard chirping into the evening last night were talking again. The air was damp, and the temperature was a little cool. On the upside, the tarps performed well, there was only a small pool of water inside of the tent, and it wasn’t near our sleeping bags. The slight channel I created outside of the tent early last night kept the water away from the entrance of the tent. My wife and I didn’t want to leave the tent, but we were both hungry. I only had two dry T shirts, a dry turtle neck, a pair of socks, and the long underwear I had been sleeping in. Everything else was damp or soaked. I didn’t want to sleep in wet clothes so I decided its would be best if I changed before I ventured outside. We had hung up damp clothes to dry from the top of the tent, but they hadn’t dried. My wife had brought one more set of clothes then me so she was able to wear dry clothes outside. The path to our cooking area was really wet; I was glad I decided to wear my water shoes. I had the choice of walking through the pools of water or skirting the edge of the trail. My water shoes had never really dried and I was used to having wet feet. Skirting the edge of the trail caused water on leaves to soak whatever we were wearing. I decided after skirting the edge once, I would prefer to only have wet feet. The wind ruined my garbage bag tarp over our cooking area. My repairs to the garbage bags were ugly but effective. I may bring a third tarp next trip to cover our cooking area. After a quick breakfast we returned to the tent and went back to bed. We woke up again close to noon; it was still raining, still cool, and still breezy. The birds still chirped. My wife wasn’t hungry, but I was. Once again I changed into my damp clothes and ventured out to our cooking area. Rather than cook anything, I decided to eat some trail mix and dried fruit. I contemplated going fishing in the canoe, but that would expose the gear under the canoe to the rain. I also thought of fishing from the shore, but I didn’t want to get any snags. If I wasn’t going fishing I didn’t want to stay out in the rain, so I went back to the tent. What a boring day. By supper time my wife was hungry, and we both went out to make dinner. We had a fair amount of schnapps left, so we poured liberal shots in our hot chocolate after we had finished eating supper. After cleaning the dishes, we returned to the tent; the rain was still falling. We were both hoping for the sun to come out. Around 8:30 pm it seemed lighter outside. I popped my head out of the tent, and the clouds didn’t look as thick. The rain was still falling, but the thinner clouds lifted our spirits a little. Perhaps tomorrow would be a better day. As we settled down to go to sleep the rain still fell. Through the night, I heard the rain hitting the tarp as I drifted in and out of sleep. As dawn broke I could hear fish jumping around the island; having slept so much yesterday, I couldn’t sleep anymore. To my surprise I realized I didn’t hear rain hitting the tarps. I was eager to get up and pack up camp. We packed up inside the tent before venturing out. The sky was still mostly cloudy, but there were occasional patches of blue. We took a few pictures of the eastern sky. This was our last day, hearing the fish jumping made me want to fish. I didn’t care too much if I became soaked today; Albert would be picking us up at the Johnson entry point at 4 pm, and we had dry clothes in Red Lake. We packed up the rest of camp and had our last breakfast in the wild. We decided to try our luck fishing around the island. We started off the west shore of the island; after a short period I caught a small walleye. I threw it back as it was too small. With no more luck quickly following the first catch we started circling the island. Close to the northern tip of the island I caught a larger walleye; it was the first keeper of the day. We continued to circle the island, and my wife caught a small walleye which she threw back. We were not catching any more around the island, we decided to start our journey back to Johnson. As we approached a narrows, a short rain shower began, and we put our rain jackets on. We saw minnows jumping out of the water followed by a large fish chasing them. At first both my wife and I tried to fish, but the current was playing havoc with the position of the canoe. I put down my rod and started paddling to keep us in a decent position. My wife continued to fish, but she didn’t catch anything. Not wanting to be late for our own pickup, we passed through the narrows. By this time the shower had stopped. Along the northern shore we could hear a stream falling into the lake we were passing through; after having luck in Lac Lammont at the base of a falls we thought it couldn’t hurt to try. As we slowly approached the falls we both cast out and started retrieving our lines. A short time later I had a fish grab my line, as I pulled it up to the canoe I realized it wasn’t a walleye. It was more white in colour. Before we could get it in the canoe the fish freed itself from my hook. Later we would determine it was most likely a whitefish. Approximately twenty feet from the base of the falls I let my line drop straight to the bottom and began jigging. After a few seconds, I felt a tug on my line and I set the hook; we had found the honey spot. In quick succession my wife and I caught six decent sized walleye; my wife caught the largest. As quickly as the action started, it also stopped. We were one fish short of our limit, but no more walleye were biting. We decided to count our blessing and clean the fish before heading into Spider Lake. By the time we stopped fishing the sky was mostly sunny. Only a slight breeze remained. The fact that this was our last day was starting to sink in. As we paddled north towards Spider Lake I was envious of the group of four young Americans that were spending 23 days here. I would be back at work on Monday. They'd be somewhere in the park, paddling, portaging, fishing, and enjoying their surroundings; I'd be back in my cubicle, my computer fan humming, the phone ringing, deadlines to be met and dollars to be made. My wife would occasionally cast out her line, but nothing bit. We reached Spider Lake, and quickly passed into the creek flowing out of it. People had marked submerged hazards with branches sticking out of the water. Had the warnings not been in place we may have damaged our canoe. The rain had swelled the creek, and the current carried us along. We wouldn't have to push ourselves to get back to Johnson. We passed through a small lake and entered another creek; this was the creek that we followed into Douglas on the first day of our trip. As we approached a small falls from above we could hear the excited voices of a larger group coming in the other direction. As we unloaded our canoe above the falls, four people came along the path, each at the end of the canoe. Two others, obviously more adventurous, were attempting to paddle up the rapids. They were not successful. It turned out to be Albert and Kelly's neighbours. They told us of the creek flowing out of Stan into the pond we could take to avoid the portage. We told them of where we had caught our fish. They were out for the long weekend, and would be making a small loop in the opposite direction we had travelled. We asked if one of them could take our picture, and they obliged our request. We hadn't learnt how to use the timer on our camera, and we hadn't asked any of the other people we saw to take our picture, so this was the first picture of us together on our trip. We thanked them and continued downstream; we turned towards the small pond at the point where we had been on our first day. It was clear where the creek entered the pond from Stan. Using the creek turned out to be a mistake. The group that told us to take the creek was travelling downstream when they used the creek; we had to fight the current and get out of the canoe on numerous occasions to pull the canoe over beaver dams. We should have stuck to the 150 metre portage. I considered this a valuable lesson learned. It was only about 2pm so we decided to try our luck fishing a little; the wind was up though and we couldn’t hold a position very well. After a brief period we gave up and headed to our last full portage. It was fairly hot out, and I was glad our food packs were light. When we reached the end, it was apparent that the water level had risen by at least four inches since the start of our trip. The muskeg was fully submerged. We piled our packs on top of the baja bags and food barrels, and made our final pass of the portage. We had arrived at Johnson at full hour early so we decided to try our luck fishing once more; we each caught a small Northern. We only had approximately 1 more kilometer to go to pick up point, so we reluctantly packed away our rods, and started paddling. As we approached the pick up point, Albert was waiting with his young daughter. We had done it, nine days, and eight nights of wilderness canoeing. Although we didn’t travel as far as we had planned, we did cover approximately 100km paddling, not including the paddling done while fishing. Counting all the trips we had to make each portage we had walked approximately 28km. We had a few scares, and had many laughs; our trip was injury free other than a few small cuts and scrapes. We both learned things about ourselves and each other. The most important aspect of the trip for me was that I shared the experience with my wife, and for that I am most thankful. What a trip to end our first year as a married couple! On July 3rd, 2005 we arrived back in Newmarket; we celebrated our first anniversary in our home with a bottle of red wine I had saved from our wedding.